Ah-he-hem, where were we now? I hope you all had a nice holiday, with fireworks and plenty of grilling. Last time, we talked a little about one of my favorite dishes of all time, fetteh. I gave a basic recipe for the Middle Eastern combination of yogurt, chickpeas, and pita bread, but now it's time to delve a bit more into the dish fetteh, and try one of my favorite variations of fetteh with eggplant and pomegranate molasses. While the history of fetteh is undocumented, it likely finds its roots in the ancient Middle Eastern dish tharida. Food historians Clifford Wright and Charles Perry have written that tharida (from the word tharada, to crumble bread into broth) involves bread moistened with stock and various meats, often layered with legumes and vegetables. Tharida historically included eggs rather than the yogurt used in fetteh. Today tharida no longer exists but fetteh is popular throughout the Arab world, and shops selling fetteh can be found on nearly every street of Damascus and across Syria, Lebanon, and Jordan. 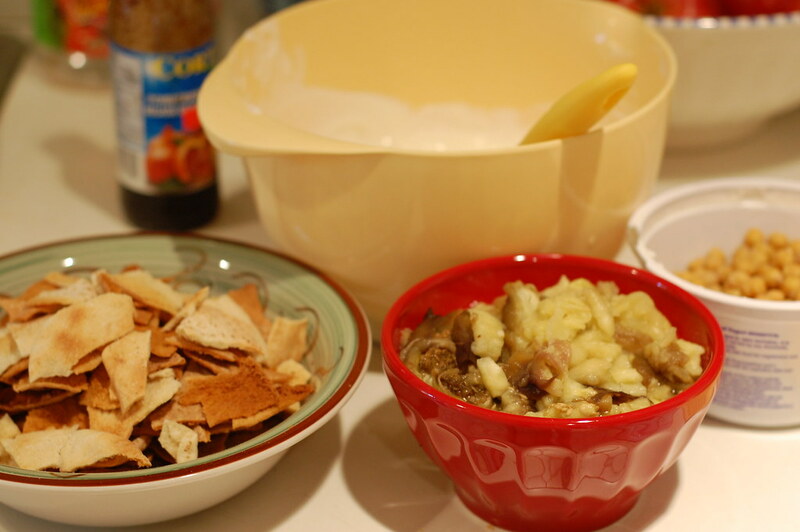 The word fetteh means to crumble, and it comes from the crumbled pita pieces used to make the dish. I think there's a pantheon of great dishes made from stale bread: pappa e pomodoro, ribollita, tostadas, stuffing, gazpacho, and I think fetteh gets a star in that walk of fame. It's a classic peasant dish made of leftovers and staples. I once saw "fetteh" translated as "Middle Eastern panade," and while not exactly accurate, it is an interesting comparison as both Mediterranean dishes rely on a layering of stale bread, dairy, broth, and legumes. These days, we're more likely to make fetteh by toasting or frying the pita pieces instead of waiting for them to get stale, and there are a myriad of variations made rich with poached chicken or lamb, even a favorite rural version involving a sheep's hoof served on top (I was served it once, and I'll admit totally turned off by the jelly-like quality that comes from the gelatin in the hoof). Here's where we'll get into fetteh technique a little, and like I said before, there are a million different ways to make fetteh. 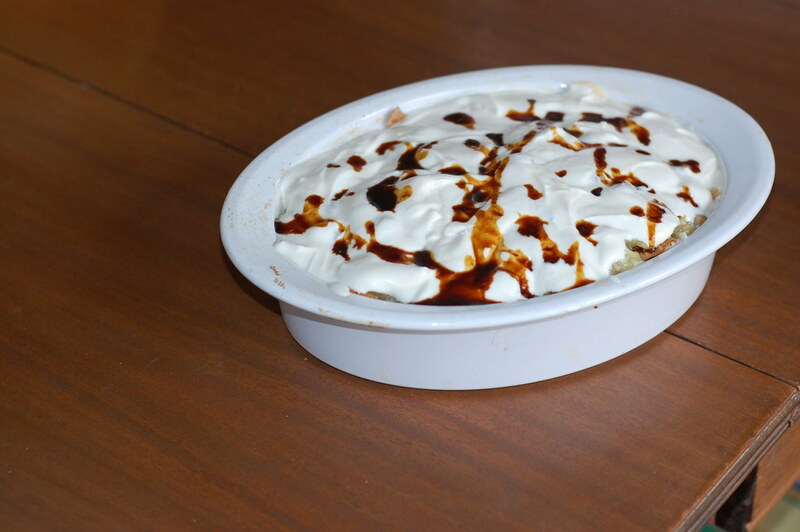 First, fetteh is served warm, but the whole dish is not heated or baked. 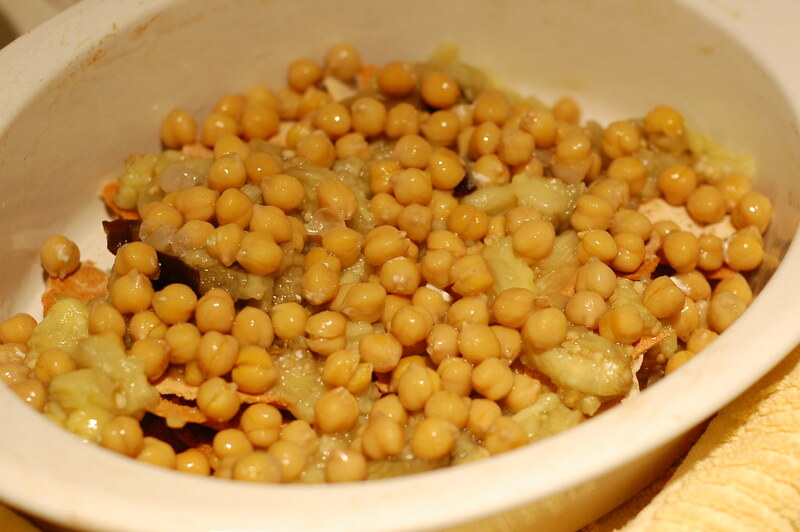 Rather, the heat comes from the freshly toasted bread and steaming hot chickpeas. By the time you take the yogurt out of the fridge and stir up the yogurt mixture, it should have come to room temperature so that it doesn't cool the dish off too much. Second, the fetteh dish should melt into a cohesive-almost-stew-like consistency. I choose either a large pyrex bowl or casserole dish, and the key to the consistency is to drizzle a little of the chickpea liquid over the pita pieces to encourage them to warm and soften into the dish, without making them soggy. If you include meat in your fetteh, like poached chicken breasts or lamb, you can drizzle that nice flavorful stock over the bread. Fetteh should be served as soon as it's prepared, and purists will tell you it should never be kept as leftovers, when it gets soggy and cold, though I've eaten my fairshare of it (it's just too good to let go). That said, it's an easily portable dish, simply carry the components separately and assemble on site. My version of eggplant fetteh is admittedly a cheaters version. The fanciest versions start with lamb-stuffed eggplants (bathinjan mehshi), and other versions involve slow simmering of lamb and slicing and frying eggplants. Me, I usually skip the lamb altogether and just toss the eggplant in the oven to roast, then scoop out the flesh. It's a working girls short cut eggplant fetteh, but one I've made so many times I could do it in my sleep. And if you've taken the time to read all this about fetteh, well, you might need a short-cut too. The amounts of yogurt may seem a bit odd, but I find buying the two containers of Greek-style and regular yogurt produces just the right amount and consistency for the yogurt sauce, without any odd leftovers. 1. Preheat oven to 450F. 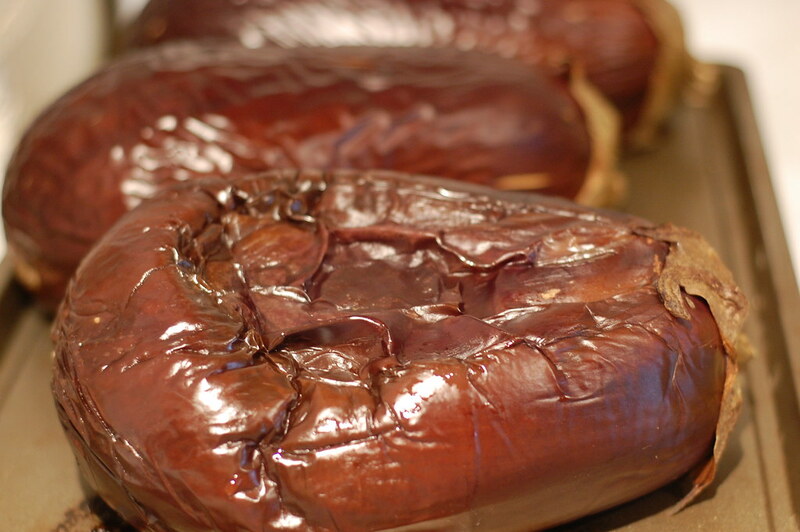 Pierce eggplant with a knife in several places, place on a baking sheet and roast in the oven until tender and collapsed, about 45 minutes. 2. Meanwhile, separate the pita breads in half and toast in the oven until golden brown and firm (watch carefully that they don't burn). Break pita into approximately 1-2 inch pieces and set aside. 3. In the bottom of a large bowl, smash the garlic clove with the salt with a fork until the garlic is pulpy. Add the lemon juice and tahini and stir to combine. Stir in both containers of yogurt. 4. Empty chickpeas with their liquid into a pan and bring to a simmer. Simmer chickpeas until they are tender and smush easily between your fingers, this often takes as long as 20 minutes. 5. When the eggplant has cooled slightly, slit open the eggplant and scoop out the flesh into a bowl, discarding the skin. Slightly crush the eggplant flesh with a fork. 6. Get out a casserole dish or large pyrex bowl. Spread some of the pita pieces over the bottom of the dish, ladle some of the chickpeas over top, along with some of the chickpea liquid so that the liquid softens the bread. Top with some of the eggplant. 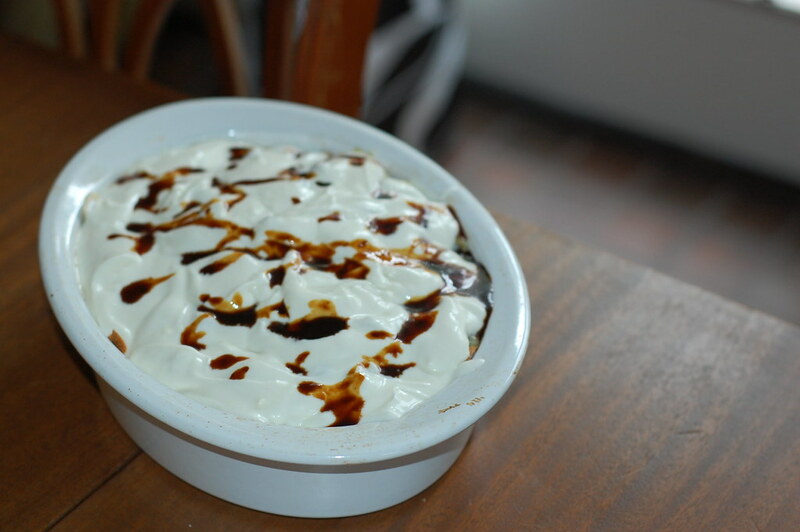 Drizzle yogurt mixture over top so that the surface is completely covered. Drizzle just a tiny bit of pomegranate molasses over top. Repeat layering (I find a casserole only needs two layers, while a bowl usually three), finishing with the yogurt over top. Finish with a drizzle of pomegranate molasses, or pomegranate seeds or pine nuts. Serve immediately. I love fetteh and mehshi. While I do like the meat based version i prefer the vegetarian ones the best. So, you can imagine how excited I am to see this. It looks great. I've never heard of or seen fetteh before but you make it look beautiful and delicious! i adore eggplant...and this version of fetteh sounds so good! This sounds wonderful - I'll be trying it soon, hopefully! Mercedes you are a woman after my own fetteh loving heart. I just posted my love for fettet betenjan on your last post, and you surprise me with this deliciousness?! As far as my mother in law's fetteh with rice, she is Palestinian who grew up in Egypt, so that might explain it. I'm Palestinian through and through, but my own family has always made fetteh the way you do in your last two posts, with no rice. I actually prefer no rice, the crunch of the toasted pita against the creamy bite of the chickpeas and smoothness of the yogurt is to die for. I will definitely be making this. I love fetteh!!! Thanks for a great post. This sounds flavorful, easy and delicious, and it uses ingredients that I always have around the house in the summer. I will have to try this one soon! This was yummy, masha Allah. I do love eggplant.